Democratic candidate kicks off campaign in Boyle Heights. 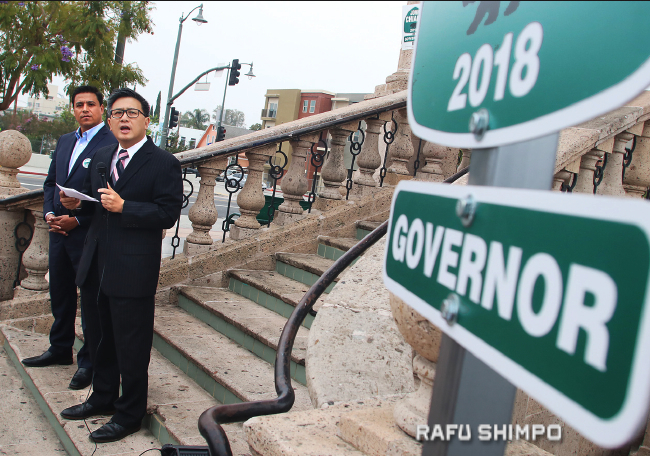 State Treasurer John Chiang, a Democratic candidate for governor in 2018, was endorsed by Los Angeles City Councilmember Jose Huizar at a campaign event on June 6 in Boyle Heights. The event marked the start of Chiang’s statewide “listening tour,” which also included a stop in San Francisco on June 7. 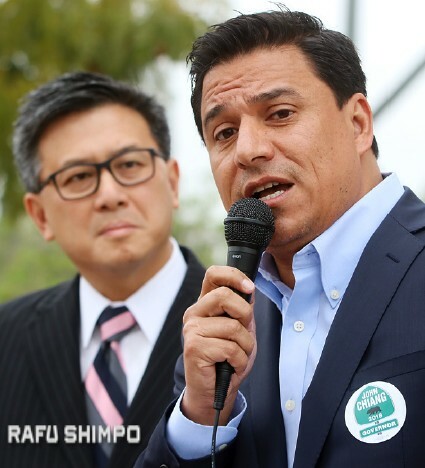 “John is the very definition of a public servant,” Huizar told a crowd of supporters at Mariachi Plaza. “If you want flash and no substance, look no further than the White House at this time and see how that’s working out. But if you want a trusted, steady and fearless leader who knows when to get tough against special interests, who knows when to cross the aisle to get things done for the people, then John Chiang is your choice for governor. “He’s been a leader on important issues like getting more money for affordable housing, making sure that more California children have access to higher education, and making sure that even in these tough economic times, he was able to find funds for those things that are important to California people … He is a progressive who knows how to balance a checkbook. “John is a person with tremendous integrity who not only values being a public servant but he really adheres to that calling. As testament to that, there was a time when the state wasn’t passing a budget even though the state legislators were required by the Constitution to pass a budget. John did an incredible thing and said, ‘We are not going to pay the state legislators until that state budget is passed and the people of the state of California get the services they need and deserve.’ That’s the type of person he is. During his visit, Chiang also visited the Libros Schmibros Lending Library and Al & Bea’s Mexican Restaurant. Former Mayor Antonio Villaraigosa, also a Democratic gubernatorial candidate, supported Huizar as his successor on the City Council. But according to City News Service, their relationship soured in 2015 when Villaraigosa backed former Los Angeles County Supervisor Gloria Molina in her bid to unseat Huizar. Also running to succeed Gov. Jerry Brown, who cannot run for re-election due to term limits, are former Lt. Gov. Gavin Newsom and former State Superintendent of Public Instruction Delaine Eastin, both Democrats. The son of immigrants from Taiwan, Chiang was born in 1962 in New York and grew up in Chicago. He graduated with honors with a degree in finance from the University of South Florida and earned a law degree from Georgetown University Law Center. He moved to Los Angeles in 1987 and got involved with the Democratic Party. Chiang began his career as a tax law specialist for the IRS, worked as an attorney for then-State Controller Gray Davis, and was on the staff of U.S. Sen. Barbara Boxer. He was appointed the Board of Equalization in 1997, elected to the board in 1998, and re-elected in 2002. He represented the 4th District, which included southern Los Angeles County. Chiang was elected state controller in 2006 and re-elected in 2010, twice defeating Republican Tony Strickland, and was elected state treasurer in 2014, defeating Republican Greg Conlon. As treasurer, Chiang imposed a 12-month ban from investment work on Wells Fargo when it was revealed that the bank had opened up to 2 million unauthorized accounts in its customers’ names in an attempt to raise profits. In a campaign video, explained that his campaign logo looks like a state highway sign because the design “was based on the shovels that the 49ers brought to California to unearth a better future for their families. They came from every corner of the Earth, and the California dream was built on the foundation of this unique experiment. Today, California is still proudly taking a different road. A reception in support of Chiang will be held on Thursday, June 22, from 5:30 to 7:30 p.m. at Imprenta Communications Group, 315 W. Ninth St., Suite 700, in Los Angeles. The special guest speakers will be Assembly Speaker Anthony Rendon (D-Paramount) and his wife, Annie Lam, who leads the League of California Cities Asian Pacific Islander Caucus. Hosts include Los Angeles City Councilmember David Ryu; co-hosts include Los Angeles Community College District Board Trustee Mike Fong, Sierra Madre Mayor Rachelle Arizmendi, San Gabriel City Councilmember Jason Pu, West Covina City Councilmember James Toma, former Alhambra City Councilmember Gary Yamauchi, and Korean American Democratic National Organization.